Welcome to the website of Long Lost Blues, the first comprehensive examination of the early blues industry and the music it produced. 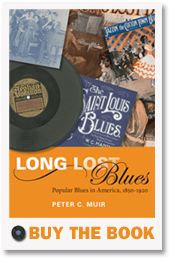 Scheduled for release in December 2009, the book promises to be one of the most important contributions to blues scholarship in recent years. The site provides background information on the book [link to About LLB page] and its author, Peter C. Muir [link to PM page]. It is also an expansion of the book’s content, containing important supplementary information for scholars and researchers [link to resources page] as well as audio downloads [link] of the book’s printed music examples.